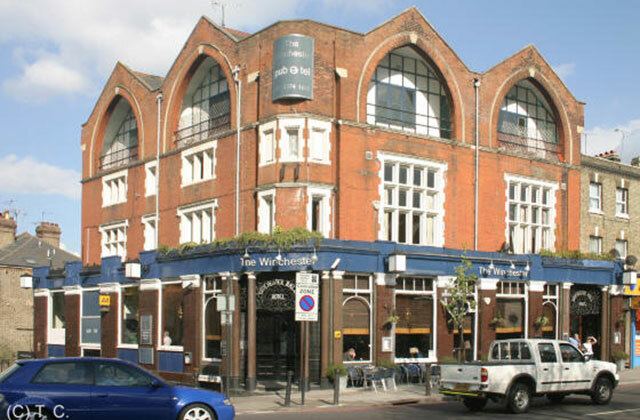 The Miltons Residents Association has launched a petition to save the historic and beautiful Winchester pub in the Archway Road from damaging further development. The Winchester Tavern was built in 1881 as part of a very distinctive parade of shops with housing above and later became the Winchester Hall Hotel. The name comes from Winchester Hall, a late 17th-century mansion nearby. Inside, the great feature is a massive, glazed-in office surrounded on three sides by the servery. It is formed by floor to ceiling glazed partition with curved glass on the front corners and its windows have remarkably lovely, delicate etched glass with trails of foliage and depictions of flowers and birds. Decorative etched original glass remains on the doors on the left (which has ‘Private’ on it) and right. The current developer has continually eroded the public areas first with the loss of the garden in the original application – described in What Pub as “an attractive, shrub-lined, heated outdoor drinking area”. Then in December 2015 permission was granted for a disabled toilet, stairs to the basement and an additional flat on the ground floor which has reduced the size of the front bar area. The latest application will now see the loss of a further part of the front bar area and the all of the rear bar (likely a former saloon bar), which forms an integral part of the original public house layout and thus contributes to its value as a heritage asset and a community facility. This is damaging to the Winchester’s heritage significance. It has recently been designated as an Asset of Community Value, which affords it “some weight” in terms of planning considerations. Local residents and What Pub described it as “Very much a community pub, sponsoring three local league football teams and a darts team and attracting clientele of all age groups.” The pub has high community value, which will be threatened by the much reduced floor area. The Winchester Hall Tavern is one of the jewels in Haringey’s pub stock and it would be a great loss to the Borough if its wonderful interior were to be ruined and the pub use threatened. Sign the petition, or formally object to Haringey Council. The incremental destruction of the Winchester Tavern Bar area looks to me like a typical strategy used by developers. Haringey do not give way any further. It’s not particularly clear from Haringey’s planning portal but the December 2015 permission was some sort of compromise. The original planning permission (granted 31 October 2014) allowing the conversion of the upper floors into 10 flats contained a specific condition that the ground floor remain in operation as a pub. There were a number of flowery undertakings by the developer about restoring the pub, as can be seen on the sign they have hung outside. The developer then sought exactly what they are after currently in a [completely unpublicised] planning application in May 2015. Some sort of deal was cut allowing for one flat instead. 10 days after that decision was entered the developer came right back with the 2 flats request – so much for the value of compromise. There are just about 200 objections lodged to the latest planning request. I have written to my councillors about the depth of local feeling on the issue. I wonder whether the planning officer’s December 2015 decision about the one flat can be reviewed or appealed somehow? He seems to have completely misjudged the local feelings about the issue – no wonder as no one knew about the May 2015 planning application. Well done those of you who have taken the time to object! We have run our Decorating buisnes in Highgate for over 60 years,I personally have witnessed the destruction of so many magnificent buildings, I’m afraid the blatant decimation of the legendary Winchester is just another example of the loss of our history to make a few quid more.